New Zealand’s Ministry of Civil Defence has launched a new DVD aimed at teaching young children how to drop and cover during an earthquake and Stan the Dog is the lead character. Stan tells kids how to get under furniture or crouch with their hands protecting their heads. 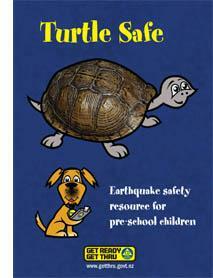 Called Turtle Safe, you can download the resources here. This entry was posted in Dogs and tagged Ministry of Civil Defense, preschool resources, Stan, Turtle Safe, What's the plan Stan?. Bookmark the permalink.